This Easy Diner potable hook on high chair folds easily and stores away in a carry case. The sturdy all steel construction comes with a fully padded seat. It features 5 point safety harness and is great for travel and restaurants. This features an exclusive double locking system secures seat to table and eliminates the need to adjust attaching mechanism after every use. It comes with a removable seat cushion for easy cleaning. For babies and toddlers up to 37 poundThe sturdy and compact Regalo Easy Diner Portable Hook-On High Chair provides a safe, comfortable seat for your baby whether it’s at home or on the go. The seat’s five-point safety harness and all-steel construction offer security while the double-locking system fastens the seat firmly in place. 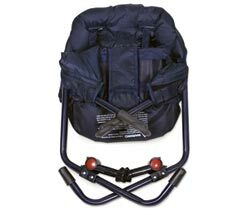 Its fully padded seat is designed with a high back which provides neck support and comfort for babies. Parents will enjoy the high chair’s ease of use. The hook-on high chair offers an easy way to provide a secure seat for your baby at virtually any table. Designed with an exclusive double-locking system, the chair is anchored on both sides by two separate gripping mechanisms that offer a stable fit without any movement. The double-locking system stays securely in place after each use, eliminating the need for daily adjustments. The high chair offers a five-point safety harness that features adjustable shoulder and waist straps, so you can create a snug, customized fit for any child. Parents and caregivers will appreciate the strength and durability in the all-steel frame construction. All materials are PVC-free and do not contain any lead or phthalates. The high chair meets safety standards set by the American Society for Testing and Materials (ASTM). Whether you’re eating at a friend’s house or out to dinner at a restaurant, the high chair offers consistency and stability for your child. The compact chair weighs just 6-1/4 pounds. It attaches to a table in seconds without any tools and folds down just as quickly. For added convenience, it can be stored away in its fabric carry case, which allows you to easily take the chair wherever you need to go. Plus, your child will enjoy eating directly from the table–just like an adult–without any messy trays. The fully padded seat along with its high-back design provides comfort for your little one, while the added back support promotes healthy posture. The high chair cleans up easily with just a simple wipe down with a damp cloth after each use. 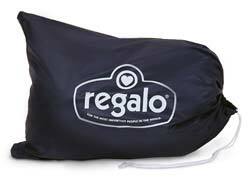 The seat cushion is removable for additional convenience while cleaning. The high chair measures 10 by 14 by 16 inches (length by width by height). 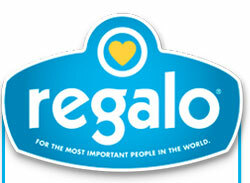 The Regalo Easy Diner Portable Hook-On High Chair is backed by a manufacturer’s limited 90-day warranty. One Regalo Easy Diner Portable Hook-On High Chair, carrying case, and instruction manual. Its fully padded design and added back support lets your toddler eat comfortably at the table with the whole family.